Guild Wars 2 breaks back into the MMO scene with its latest expansion Path of Fire, which is now live and playable! Taking place after the events of Heart of Thorns, Path of Fire sees the return of one of Tyria’s old gods Balthazar. The people of Tyria worshipped the gods for centuries, but prayers always went unanswered… until now. Unfortunately for humanity, Balthazar, the god of fire and war, cares little for mortal life. Instead, he seeks to take over all of Tyria with a destructive force, leaving nothing but a path of fire in his wake. Balthazar’s march starts in the southern regions of Tyria, where the Crystal Desert lies. The southern region opens up with this expansion letting players to explore new mythical lands, including desert plains, ancient temples, and more. Players will also discover the mysterious kingdom of Elona, where the fate of the Elonian people will finally be discovered. 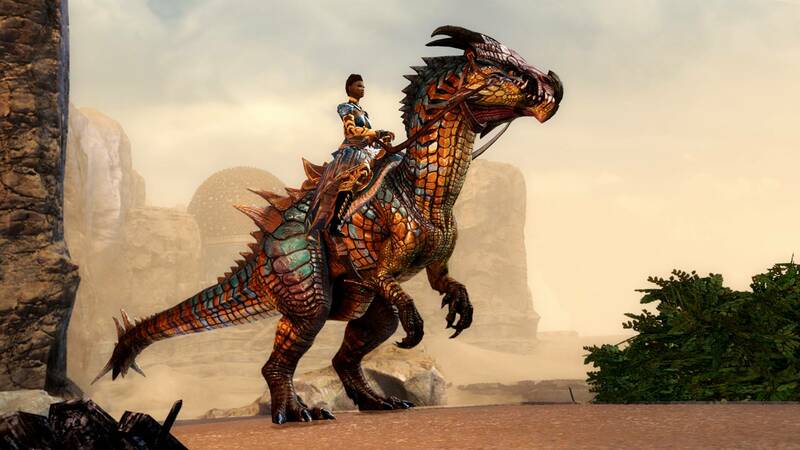 Path of Fire also introduces a fun new way to explore the brand new zones – the long awaited mounts. After you’ve progress through the mastery system, you’ll be able to unlock the four mounts, each with the own special abilities. Raptors can leap long distances, Skimmers can float across treacherous terrain, Springers can leap high into the sky to allow for massive vertical leaps, and the Jackals can utilize magical sand portals. Level 80 characters are granted access to brand new Elite Specializations which lets your profession focus on an individual set of skills. Guardians can become Firebrands, lorekeeprers that specialize in using magical fire with axes and mantras. Engineers can become Holosmiths, tinkerers who have harnessed the power of the sun. And of course, there’s tons of new weapon and armor skins and sets for you to collect. If you love customizing the looks of your hero, there’s a lot to discover in Path of Fire with the Elonian-themed sets. Guild members can also claim a new guild hall in the Crystal Desert to live like Elonian nobility. Fancy! Guild Wars 2: Path of Fire launches today for $29.99 USD for the standard edition. You’ll receive a free max-level boost for any of your character upon purchasing the expansion, so you can jump right into the new content!